A Cowboy. Firefighter. That loves cats. 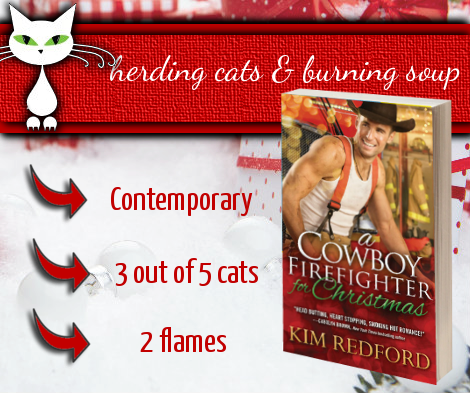 A Cowboy Firefighter for Christmas was a sweet holiday romance full of spirit, heart and quirky small town charm! I had a good time with this one. It was an easy read as Trey and the citizens of Wildcat Bluff gear up to celebrate Christmas, battle fires threatening their lands and welcome a curious outsider into their midst. I really enjoyed the characters. Trey--the aforementioned cowboy firefighter cat lover-- and Misty--who just arrived to town and was immediately pulled into the chaos and festivities. They were fun, easy to like and just good people. A little corny now and again (and not quite as funny as they thought they were) but entertaining as they danced around each other, flirted, saved kittens and tried to figure who was intentionally harassing the town by starting fires. They were good together, had some nice chemistry and just a tiny bit of heat. Seriously, yall. I was wanting some hot and steamy cowboy firefighter lovin mmhmm but it turned out to be pretty dang light and brief. *sniffles* There was some good lead up but actual deed...total quickies page-wise. It was still fun watching them fall in love and get to know each other though. The town itself was fabulous and quirky. They're all smitten with cats and totally pamper them. From personal pets to barn cats. Cats are KING in Wildcat Bluff. Woohoo! Gotta love that. It was fun getting to know all of the side characters and seeing how much they cared for each other. They've got spirit and charm in spades. Definitely looking forward to more from them. The suspense of who was starting fires all over the place was pretty predictable and writing-wise this one did feel like a first novel. A little rough in spots, overly detailed in others and that sort of thing. Any pant-worthy cowboys or firefighters out there you'd rec?